The Cleveland Indians certainly started off the 1940 season in grand fashion. Bob Feller threw the only Opening Day no-hitter in baseball history on April 16 at Comiskey Park. Feller was far from sharp as he struck out eight, but walked five on a cold, raw day in the aptly named Windy City. But his teammates provided just enough offense and timely defense to secure a 1-0 victory. The Tribe had a blend of youngsters and veterans on the squad. Ken Keltner was in just his third full season, while Lou Boudreau and Ray Mack were in their first. Veterans Ben Chapman, Mel Harder, Hal Trosky, Rollie Hemsley, and Feller provided leadership. The Detroit Tigers may not have had a pitcher who could fire the ball the way Feller could. But they did have Bobo Newsom. Newsom finished second to Feller in wins (27 to 21), strikeouts (261 to 164) and ERA (2.61 to 2.83) in the 1940American League. Feller may have won the pitching equivalent of the Triple Crown, but at the end of the day, it would be Newsom who would bag the biggest prize of all. The Tigers offense was powered by right-handed batters Hank Greenberg and Rudy York. Greenberg led the AL in home runs (41), doubles (50), RBIs (150) and slugging percentage (.670). York was third in homers (33), tied for second in doubles (46), second in RBIs (134) and fourth in slugging (.583). Throw in Charlie Gehringer, who batted .313, and Barney McCosky, who led the team with 200 hits and batted .340, and the Tigers lineup was one to be feared. Even though the Indians were a talented team, the one variable that the players felt was holding them back was their manager, Oscar Vitt. Vitt had an acerbic, cynical type of personality and believed that the best way to get the most out of his material was to insult and threaten his players. No player was exempt from Vitt’s frequent volleys of putdowns and biting sarcasm. The Indians sought to impeach Vitt, as the veterans who were picked as the team’s representatives met with owner Alva Bradley in an attempt to oust the manager. Bradley told the players he would take it under advisement, warning them not to let the press get a whiff of their intentions. Of course, word leaked and Gordon Cobbledick of the Plain Dealer broke the story on June 14. “Indians Demand Ouster of Vitt; Can’t Win for Him, Bradley Told,” blared the headlines in the Cleveland daily. Much to his credit, Bradley made no such move against Vitt, and stuck by his manager. The Indians were now referred to as the “Crybaby Indians” and it was not uncommon to see the players pelted with rattlers, pacifiers, produce, and the like from the fans in the stands. The Indians were the dupes of the league, and although they publicly retracted their actions in a written statement, it was too late to escape the court of public ridicule. In spite of this development, the Indians and Tigers were nip-and-tuck the whole season. As the curtain came down on July, both sported 57-38 records atop the AL standings. Buoyed by a 17-12 record in August, Cleveland moved ahead of the Tigers, who played .500 at 15-15 for the month. The Tigers evened matters when they swept the Tribe in a three-game series at Briggs Stadium September 4-6. The teams were deadlocked with 85-61-1 records when Cleveland visited Detroit for a three-game series beginning on September 20. The Tigers took two of the three games to nudge ahead of the Indians. After taking two from the White Sox, the Tigers built their lead to two games as they headed to Cleveland for a season-ending three-game set. The first game, at Cleveland Stadium on September 27, promised to be a delight, with Feller scheduled to pitch against Detroit’s Schoolboy Rowe. Cleveland had to win and therefore had to go with its best thoroughbred. But if the Tigers lost, manager Del Baker could go with Rowe the next day. Or, as the Detroit Free Press reported, “(Baker) could use Rowe and decide the game in one sharp struggle. Or he could use some of his lesser moundsmen, like Harold Newhouser or Paul Trout. If either of them was right and Feller was not at top form, the Tigers would win.”1 In the end, Baker went with Floyd Giebell. The right-handed hurler had made his first start of the season on September 19, as the Tigers bombed the Philadelphia Athletics, 13-2. Giebell was a recent call-up from Buffalo, where his record was 15-17. The Tigers led 2-0, and that’s how it would end. Cleveland put two runners aboard in each of the the fourth, fifth, and seventh innings, but Giebell escaped without any damage. The Tigers managed only three hits off Feller, but York’s homer was the big, and only blow. Feller whiffed four but walked eight batters. “I haven’t any alibi,” said Feller. “The kid (Giebell) pitched a great game.”4 Giebell scattered six hits, striking out six and walking two. Cleveland won the last two games of the series, both one-run affairs, and finished a single game behind the Tigers. The Yankees joined the fray after posting a 20-10 record in August and 20-12 in September. But the New Yorkers were too far behind to catch the Tigers; they finished in third place, two games off the pace. Detroit lost the World Series to Cincinnati in seven games. 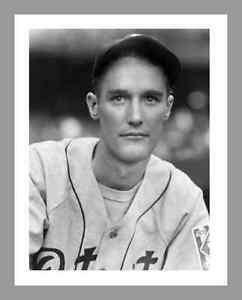 As for Giebell, he pitched in 17 games for Detroit in 1941, making two starts with no decisions. He returned to the minor leagues, where he pitched until 1948. He never returned to the big leagues. In addition to the sources cited in the Notes, the author also accessed Retrosheet.org, and Baseball-Reference.com. 1 Charles P. Ward, “York’s Two-Run Homer Brings Defeat to Feller,” Detroit Free Press, September 28, 2017: 1. 2 Charles P. Ward, “Rookie Giebell’s Masterful Hurling in Pinches and York’s 33rd Homer Beat Feller,” Detroit Free Press, September 28, 1940: 13.